Evonik’s Degaroute ... long life and lower green impact. 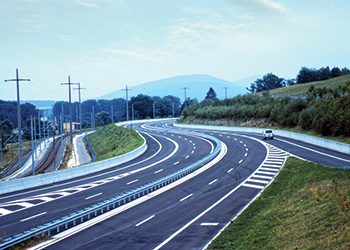 In line with the trend toward greater sustainability and eco-friendly technologies, Evonik has conducted a life cycle assessment (LCA) on Degaroute that has demonstrated that this reaction resin for road markings that boasts greater longevity can make a valuable contribution to environmental and climate protection. The LCA (in accordance with ISO 14040/14044) study factored in the entire value-added chain, from the raw materials, through production and use, to disposal or recycling. Transportation and packaging materials were also considered. This study investigated the environmental impact of applying and maintaining road markings – a middle stripe and two side stripes – on a two-lane, 1-km section of roadway. The assumed traffic volume was of 10,000 to 15,000 vehicles per day of a typical highway. Because such a road has to be resurfaced after about a decade, the marking-related environmental impact was calculated for a 10-year period. Depending on the technology used, the markings may have to be re-applied multiple times over this period. The study analysed the four most important material technologies used for road markings in Europe: solvent-based and water-based paints, thermoplastic and cold-plastic systems. Because solvent- and water-based paints generally display a shorter useful life, they are primarily used for roads with low traffic volumes. In contrast, thermoplastic and cold-plastic systems offer significantly greater longevity and are suitable for busy roads and highways. With a content of 20 to 40 per cent, Degaroute is a key component of cold-plastic formulations. Visibility at night ... key element for road markings. The critical factor that determines the efficiency and longevity of road markings is that they have to be clearly visible at night and in bad weather conditions such as fog and rain. 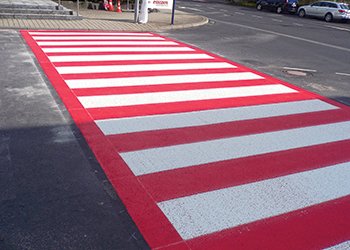 Traffic safety is ensured only when drivers can fully distinguish the side and middle stripes. This is why all markings contain tiny glass beads on the surface, which reflect headlights so that the eyes perceive a bright white marking. But the amount of adhesion of the glass beads in the polymer matrix differs depending on the material technology. On busy roads, the embedded particles are scratched over time or even lost completely through tyre wear. Also lack of visibility, especially at night, can have potentially serious consequences. This is why the markings have to be renewed on a regular basis. The frequency and environmental impact of the re-application of road markings was also part of Evonik’s LCA study. The LCA demonstrated that the degree of environmental damage – for example, carbon dioxide (CO2) emissions and the associated global warming potential – is directly connected to the longevity of the road markings. Of the four systems studied, cold-plastic technology displayed the highest longevity: the road markings had to be re-applied only four times within 10 years. In contrast, the solvent-based systems had to be repaired each year to maintain the markings. This means significantly higher material consumption. While hot-spray plastic offers high longevity, this degree of durability is reached only with high material consumption per application, which makes it a cost driver. Markings done using cold-plastic technology last longer. Cold-plastic technology offers another advantage when it comes to agglomerate markings, which have a fine structure 2 to 3 mm high. This type of marking is used primarily on highways because it offers higher visibility, especially on wet streets. Thanks to its three-dimensional structure, raindrops run off the glass beads and light reflection is preserved. The thermosetting properties of this marking system make the three-dimensional surface structure extremely strong and long-lasting. This is why a complete side or middle stripe never has to be replaced during maintenance. Refreshing the surface is all that is needed. With the help of spray technology, all that is needed is a layer of marking material 0.3-mm thick to serve as an anchor for a fresh layer of glass beads. This makes the road markings clearly visible again, even when it is dark and wet, and extends their useful life by another two years. Less new material is required, therefore, to restore functionality – and that protects the environment. The markings can be renewed in this way up to three times – a factor that was also included in the LCA study. As the results of the study demonstrate, renewing the markings using spray technology is an ideal solution for satisfying both safety and environmental requirements. Long-lasting road markings offer yet another advantage: they reduce the amount of work required to maintain roads. This reduces the potential risk not only for road workers but for all road users, because accidents often occur in these work zones. It also prevents traffic jams, which lowers emissions and reduces environmental pollution. 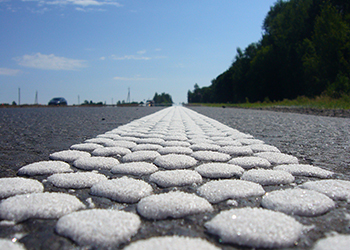 Owing to their higher longevity, they can also save on another component required for road markings: the white pigment titanium dioxide. Because the production of the pigment is extremely energy-intensive, having to refurbish roads only every four years offers a significant environmental advantage.